Our top pick is this lightweight Hoover backpack vacuum with a chiropractor harness design for reducing body strain and increasing portability during vacuuming. It weighs less than 10lbs for ease in cleaning small and large spaces. Moreover, it is highly versatile during vacuuming thanks to its useful accompanying attachment tools. In addition, its HEPA filter is good at preventing the spread of allergens back into your surroundings, once vacuumed. What to Look for While Buying Backpack Vacuum Cleaners? There is nothing as convenient as a backpack vacuum cleaner. It has a compact, lightweight design for ease of portability and operation since it is to fit on your back, just like a backpack.Moreover, the best backpack vacuum allows for easier movements and maneuverability anywhere you want to clean. Besides, it works efficiently with no tension or pressure on your body parts, even the back, and neck. However, since the market is flooded with them, it can be hard to pick the best backpack vacuum for your cleaning needs. For this reason, we have compiled a very legit top 10 lists of the best and affordable backpack vacuums in this, informative backpack vacuum reviews. We also have buying tips and reasons for ownership. Gone are the back aching and muscle soring vacuuming days. As you can now clean narrow, small and large rooms with ease, no fatigue. All thanks to this backpack vacuum with a chiropractor harness. Besides, it is highly portable with no strains on your back or neck. You can move and switch power outlets in between your vacuuming, with its extra-long 48-feet 3-wire quick-change power cord. This also means quick maneuverability and movements during vacuuming, especially for large spaces. This hoover backpack vacuum is not intrusive during operation. As much as it has high suction power, it works very quietly at 66dBA. It comes with useful attachment tools for thorough coverage of different out of reach places like ceilings and corners. They include a 6-inch crevice tool, 11-inch turbo floor tool, 2-inch dusting brush and a 4-inch upholstery tool. There is also a 60-inch positive locking hose, and 38-inch two-piece straight metal wands. Its 8.5 Amp motor produces 120 CFM of airflow. This means that you can complete your cleaning tasks fast. Moreover, your cleaning sessions can never be interrupted, as the suction power is never lost, no matter where you are cleaning. Besides, the suction motor is very quiet during operation, no disturbances to your surroundings. This hoover backpack vacuum has a dust bag that can carry up to 6.4 quarts of dust and debris. It conveniently uses a disposable paper bag insert or a shakeout cloth liner for dirt collection. You can monitor its dust capacity via its clear dome lid for timely emptying. It has a hypercone filter made with HEPA media filter that removes up to 99.97% of 0.3 microns or smaller particles for an allergy free environment. This filter can keep the dust mites, mold spores, pollen, pet dander and other debris locked away, for a healthy breathable air. Besides, it is conveniently washable and replaceable. Apart from its HEPA filter, it also has an external motor filter that removes and clears dust on a weekly basis. This ProTeam backpack vacuum is one of the best of its kind, tackling demanding cleaning tasks. Its 9.9 Amp motor produces a high airflow of 150 CFM and 100-inch static lift. This makes it the most suitable vacuum cleaner for handling cleaning needs in high-traffic places like meeting halls, schools, and universities. It comes with a flexible hose, soft dusting brush, crevice tool, upholstery tool, telescoping wand, as well as a xover multi-surface floor tool, for efficient and effective vacuuming with less energy and effort. This commercial vacuum unit has a long 50-foot power cord that allows for timely cleaning of large spaces without the constant and tiring unplug and plug process. It comes with a 3-year warranty on parts, labor, and motor and a lifetime warranty on molded body parts. This vacuum has a powerful motor that enhances its productivity level. It can clean hard floors from tiles, hardwood, and linoleum, as well as take care of low pile carpets, upholstery, stairs, vents, and ceiling fans. It achieves this using its attachment tools. Besides, the tools allow for maneuverability under and around furniture and other above-floor areas. Its organically treated Intercept Micro Filters plus its four level filtration system efficiently captures up to 99.9% of dust mites, bacteria, pollen and other particles of 1 micron and large for a better indoor air quality. Likewise, it protects you against different allergies. You can manage to stay balanced and still feel light with this vacuum on your back. This is because its adjustable harness is designed to distribute your weight evenly, using your body core and leg muscles for less body strain and fatigue. Moreover, it reduces accidental contact with the walls, while responding to your motion. This is your all-around ergonomic backpack vacuum cleaner that is used in different settings from pest control, hospitals, schools, hotels, warehouses, and offices. Besides, it is also great with stairs, entryways, ceilings, blinds, and drapes as well as other hard to reach points in your home or office. It can convert from a vacuum cleaner to a blower for commercial and residential settings. Moreover, you can cover every inch of your space with it thanks to its cleaning attachment tools that make everything easy and fast during cleanups. These attachment tools include a hose, exhaust filter cover, blower adapter, extension wand as well as a set of three-blower nozzle, a floor brush, a round brush, furniture nozzle, crevice tool as well as an air driven turbo brush and an extension cord strain relief. Likewise, it also has 2 HEPA bags, a shakeout bag, pre-motor and exhaust filter set as well as a set of filter plugs. In addition, it is lightweight making its maneuverability comfortable and easy. You can convert it to your left or right hand, for convenience. This residential and commercial backpack vacuum utilizes a four-level filtration system that involves an 8 quart HEPA bag, shakeout cloth bag, as well as a HEPA pre-motor filter and an exhaust filter for better and enhanced performance during use. Its HEPA filter can take care of 99.97% of 0.3 microns, picking up all allergen triggers from pollen, dust, crumbs, and hair, for a healthy and allergy free indoor surroundings. At 1400 watt, 12-Amp motor and 120 volts, this vacuum cleaner deliver as expected. It has a CFM output of 106 and easily converts into a blower with three-set blower nozzles. This vacuum appliance has adjustable straps and belt loops, which ensure that you have a comfortable but firm fit, for proper back support during vacuuming. Besides, its ergonomic design allows for mobile cleaning solutions with ease, no muscles, neck or back strains. 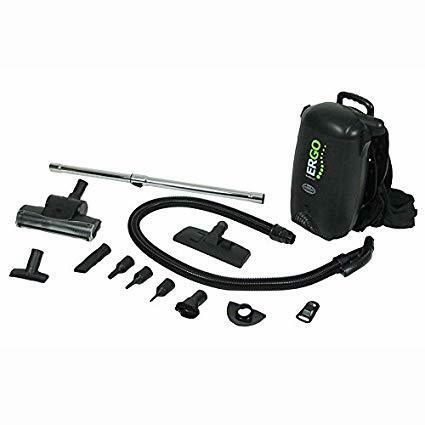 This HEPA backpack vacuum is a commercial grade that covers different surfaces be it at home or office setting. It has a reliable powerful motor that ensures it does not lose suction during vacuuming. Moreover, it has a range of attachment tools that enhance its performance at different levels of cleaning from floor to above-floor areas. Likewise, its 50-foot cord length allows for efficient and fast vacuuming in large spaces. In addition, it has an ergonomic shoulder harness from Deuter that fits any user, no back or neck pain. This is because its design transfers weight to your hips eliminating any chances of back strains. Besides, its Deuter Air-comfort harness reduces perspiration by up to 25%, while its Variquick system helps in adjusting the vacuum to the exact length of your torso. You can also fit some tools on the waist belt. It comes with a one-year warranty on manufacturer defects. This means that when it comes to maintenance, it is fully covered in terms of all replacement parts and repair services. Likewise, it offers live customer support 24/7. This device includes safety features that ensure it does not cause any accident when knocked over or tilted. The features include an anti-tilt switch and a CSA thermocouple. It includes a wheel system for easy portability and storage. Therefore, you will never have to worry about mobility issues with this patio heater. This ProTeam backpack vacuum has excellent ratings when it comes to using, maintenance and durability. It has strong suction with airflow of 159 CFM, making it the best commercial design backpack vacuum for the foodservice industry. It can be very useful for bars, nightclubs, restaurants, hotels as well as schools and cafeterias. Moreover, it comes with a complete Restaurant Tool Kit for meeting the demands of this industry. Of course, you can also use it at home. In addition, it features a 50-foot extension power cord and comes with useful attachment tools/Restaurant Tool Kit for versatility in use. These attachment tools include a flexible hose, upholstery tool, crevice tool, hard floor tool, soft dusting brush as well as a carpet floor tool and a two-piece wand. It has a 3-year warranty on labor, motor and other parts as well as a limited lifetime warranty on molded parts. This harness material features back and shoulder pads for comfort during use. It also has an improved lumbar support as well as a stronger adjustable sternum strap. Moreover, its close fit to your body helps it prevent accidental contact with walls by responding to your motion, during vacuuming. Besides, it has an open-weave design for dissipating heat, so that you stay cool all the time. This backpack vacuum can capture up to 99.97% of allergen and asthma causing particles as small as 1 micron and above, for quality breathable air indoors. This is all possible due to its four-stage filtration system with HEPA media filter and organically treated Intercept Micro Filters. You can use this vacuum cleaner to clean hardwood and tiled floors, low-pile carpets, ceiling fans, upholstery, furniture, stairs, light fixtures and ventilation systems. Besides, you can maneuver it anywhere you want to be it under furniture or above-floor areas, thanks to its attachment cleaning tools. If you are looking for a cordless backpack vacuum, then here is one reliable one. It can easily run up to 90-minutes nonstop on its low setting. You can also opt for a high setting but it will run continuously for an hour using its two lithium-ion batteries. Its two-18V LXT 5.0Ah, lithium-ion battery offers 50% more run time when compared to other backpack vacuum cleaners in its category. Likewise, its charge time is up to 3 times faster. This powerful vacuum cleaner is useful in construction sites, thanks to its dust extraction solution for contractors. You can use it as a small capacity onboard dust collection system or as a standard vacuum unit that sits on the floor surface. In addition, it features a ½-gallon disposable filter dust bag, very convenient and easy to replace and dispose of. This cordless backpack vacuum has an excellent and reliable powerful BL brushless motor that generates up to 53 CFM of airflow and 28.5-inch of water lift. This gives it high suction power for quick vacuuming in less time. This vacuum has a 2-stage HEPA filtration system that ensures the removal of 99.97% of particles of over .3 microns. Besides, this HEPA filter prevents allergy triggers that may be a cause for health problems, especially those related to your respiratory system. Its vacuuming versatility is due to its cleaning attachment tools that make work efficient for a thorough cleanup of every corner of your space from floor to above-floor areas. They include a 39-inch flexible hose, floor nozzle, round brush and a telescoping extension wand with 20-34-inch additional reach. This HEPA backpack vacuum has a convenient ergonomic design that will not strain your joints, no matter how long you use it. Besides, it is ideal for cleaning high and hard to reach places like ceiling fans and high air vents. Moreover, its ease of use is aided with its 8-piece tool kit for different cleaning tasks at different places. These attachments allow for versatility when it comes to cleaning. Besides, it has a lightweight design with a swivel tip on the front part of its hose for flexible cleaning on high and low places. In addition, it has a HEPA filtration system and comes with a convenient 50-foot power cord for vacuuming large spaces quickly. It has a 4-foot vacuum hose. Its 1080-watt Ametek motor equals to its high suction power. This vacuum has a very high and effective suction power that allows it to pick large debris even from foodstuff and pet hair with ease, no hassle. It does not matter where you are cleaning the suction power will never be lost. This feature helps protect its motor in case the vacuum dust bag fills up without your knowledge. It protects it by monitoring the fill level, as you vacuum and immediately auto-shuts the system once full. Besides, it ensures that the whole vacuum and its motor are in tiptop shape, no technical problems. You will save loads of money on buying replacement bags, as its cloth dust bag is reusable. You just empty it via its twist off lid, then clean it and put it back on. Its capacity is 6 quart. This backpack vacuum is highly portable and lightweight for efficient vacuuming of every inch of your home floor and above-floor. Besides, it is the best-fit cleaning hard to reach places. You can use it to move around offices and large spaces. Moreover, its long 50-inch power cord will not limit you when it comes to cleaning. You can cover large spaces with ease no constant unplugs and plugs. This corded vacuum has a convenient 12-inch cleaning path for quick and fewer passes that saves cleaning time. It has a 6-quart disposable bag and comes with a 4-inch metal wand as well as other assorted 1-1/2-inch attachment tools for cleaning low-pile carpets and bare floor. You can now enjoy fresh clean air after cleaning with this backpack vacuum. This is because its four-stage HEPA filtration system generates a fresh clean atmosphere, by eliminating up to 99.97% of harmful contaminants and messes as low as 0.3 microns. Its high suction power is all due to its 11.5 Amp motor power, which clears out all debris and dust on bare floors and low-pile carpets. Besides, its efficiency does not reduce even when you are cleaning the stairs or any other high or low places. This vacuum is safe and does not pose any environmental threat even indoors. This is because it is UL/CUL/CSA approved for commercial use and meets all the LEED requirements. It also has a Carpet and Rug Institute, CRI Green Label. This is one useful restaurant industrial commercial backpack vacuum with effective cleaning tools for covering every inch of your home, office space and even restaurant. It can cover up to 13,000 square foot of warehouse space with ease. It is highly dependable and powerful when it comes to cleaning different surfaces. Besides, its lightweight design and wide floor tool allow for maneuverability in different places, both high and low. You can even use its crevice tool to clean in between sofa cushions and against walls. Can cover up to 13,000 square foot of warehouse space with ease. In addition, it features a pet tool with a geared belt and a spinning brush roll. It also has a crushproof hose. Besides, it can fit any user comfortably no strains to the body, thanks to its adjustable straps. It has an easy-to-carry handle for convenience. This commercial vacuum has a sealed HEPA filter with a 10-quart SMS washable cloth bag as well as six HEPA filtration bags. Its dust bag can last longer due to its size. Besides, it is ideal for allergy sufferers due to its sealed HEPA filter. It features a powerful motor system that produces 145+ CFM and 120-inches of water lift for thorough deep cleaning of high-pile carpets. It can also clear any debris on low-pile carpets and bare floors, with ease. You will also get some premium tools with it for flexible cleaning of floors and above-floor places. These attachment tools include a crevice tool, upholstery tool with a slide off brush, duster brush, as well as a deluxe floor tool and an air-driven power mini head with a brush roll. This is the best backpack vacuum for doing small contract cleanings or any other commercial cleaning, as it is lightweight and highly portable for convenient and flexible movements. It is a powerful vacuum, which can clean the stairs, offices, warehouses, ceilings, ledges, entryways, as well as lobby furniture and any other type of furniture for that matter, without losing suction power. Moreover, it comes with some convenient cleaning tools you can attach for better coverage of high and low places. These bare and carpet floor attachment tools include a crevice corner tool, floor tool with bristles, oval brush, as well as a floor tool with scallops, upholstery tool and brush, a hose and a hose extension as well as utensil and extension. You also get a two-piece aluminum wand, an extension cord, a HEPA bag, shakeout bag, as well as a premotor and an exhaust filter set. This vacuum is best suited for noise sensitive places like the office, due to its quiet operation, which is at 72 decibels. It is much quiet than a telephone dial and will not disrupt anybody no matter where it is used. As compact as it is this vacuum features a very powerful motor system that generates a high suction power, which it does not lose no matter where it is being cleaned. Moreover, it produces a higher airflow of 106 CFM, making it ideal for cleaning different areas from floor surfaces to above-floor areas. Its big dust bag capacity HEPA bag traps up to 99.97% of debris and other particles, for a clean and fresh environment. Moreover, the HEPA feature makes it a perfect fit for allergy sufferers. With the high-popularity of backpack vacuum cleaners, it is not easy making a good purchase. The market itself is full of fake and exaggerated models marketed as top-quality that picking a quality one becomes hard and stressful. Suction Power– This is usually important, as it determines how efficient the vacuum cleaner will be. Therefore, always check on its motor power, the higher the better for sufficient performance. Likewise, check for its airflow rate in CFM, the higher the better. It does not matter where you will be cleaning, higher airflow rate and suction power is important for efficiency during vacuuming. Weight– The vacuum should weigh less for easy movements and enhanced portability. It should feel comfortable on your back with no unnecessary strain or effort. Filters– A stronger filter is essential for proper absorption of dust and other debris. You can check on the type of filtration it has and the stages. Three, four or five-stage filtration is the best for efficient vacuum performance. Power Cord– A long power cords is important for unrestricted movement and reach during vacuuming. Therefore, check it and see if its length is enough for your cleaning needs. Hose Length– This will determine whether or, not you will be stooping down during vacuuming. For easier cleaning as well as better reach and zero back problems, always check for its length depending on your own height. The longer it is the better for effective cleaning. Dust Bag Capacity- A higher dust bag capacity equals less emptying trips. Therefore, opt for a model with 1-gallon and above dirt carrying capacity, anything lower is unacceptable. Attachment Cleaning Tools– You should check on its accompanying attachment tools, their reach, and importance to your cleaning needs. Harness systems– Since we have different body sizes, an adjustable harness system are the best option for comfort and easy movement. Besides, it limits injuries related to carrying the vacuum cleaner. Moreover, it should have breathable material or be padded for added comfort. Need and Budget– Since this type of vacuum is mostly for commercial use, it has a higher price tag. However, you can always do some research on different reputable brands and their models, to see where you can fair very well. Nevertheless, the best backpack vacuum is one that can meet your cleaning needs. So get to know your needs before placing a budget on this type of vacuum. Brand– Not all vacuums in this category has the same qualities and performance level. Some brands have different and far better creation than others. Therefore, check on the reputation of the brand before making your purchase. Warranty– This matters a lot, as it can tell you how effective and durable your vacuum will be. Nonetheless, always check the warranty coverage and its length, the longer the better. There are many vacuums in the market but when it comes to picking the best one for your home or business needs, a backpack vacuum is likely to do the cleaning better than any other type of vacuum out there. This is because its design and construction are for heavy-duty commercial cleaning. Therefore, no matter where you use it, it will be many times efficient than other types of vacuum cleaners. Here are some few concrete reasons why you should always opt for a backpack vacuum cleaner, as opposed to any other type of vacuum cleaner in the marketplace, be it for home or commercial use. A backpack vacuum usually has a lightweight construction for ease of maneuverability and portability. Therefore, you can easily cover more spacewalking with it on your back, than you would with another vacuum cleaner that needs constant hand lifting and carrying. It gives you more freedom in terms of motion. You can clean efficiently in no time, with no vacuum tangles or intrusions if it is a corded one, as the power cord usually dangles behind you. Vacuums in this group are usually less risky when it comes to using. It is hard to get injuries or body strains while carrying it on your back. This is because its lightweight design will typically balance on your back, minimizing risky and extreme arm and leg movements that are a cause of back pain and minor muscle injuries. It is this ergonomic design that helps your body to adopt a more natural neutral stance, the more you use it. Since backpack vacuums are designed for commercial use, their suction power is very high probably for better performance. Therefore, if you opt to use it at home it will be much better and faster in terms of performance level when compared to other conventional vacuum cleaners for home use. Any type of vacuum in this category is usually convenient and easy to maneuver around small and large spaces from tight corners to ceilings. You will not be restricted in any way when it comes to movements and it takes very little space during use, which is your movement and standing space since it is on your back. Since they are lightweight and compact, they are much easier to store even if you have a tiny apartment. Now you have an idea of how to pick the best backpack vacuum for your home, office, restaurant and warehouse cleaning. Feel free to pick any of the listed backpack vacuums in this, backpack vacuum reviews depending on your cleaning needs. They are among the best backpack vacuum in the current market, with regard to their prices.